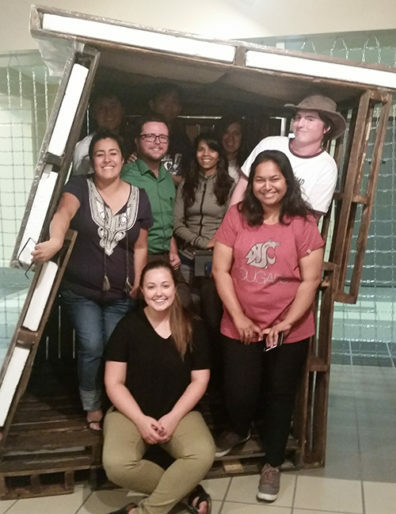 Spring 2016 Advanced Tectonics (ARCH 531) class in a movable shelter made of wood pallets and Styrofoam. Students in the Spring 2016 Advanced Tectonics (ARCH 531) course taught by Omar Al-Hassawi were challenged to address an issue with complex roots. Their assignment: develop innovative architectural solutions for temporarily sheltering the homeless. According to the National Alliance to End Homelessness, as of the last official count, about 564,708 people experience homelessness on any given night in the United States. The Alliance also estimates that in a year, there are approximately 550,000 unaccompanied, single youth and young adults up to age 24 who experience a homelessness episode of longer than one week. Approximately 380,000 of those youth are under age 18. These statistics are a starting point from which communities and the federal government can scale resources and interventions. 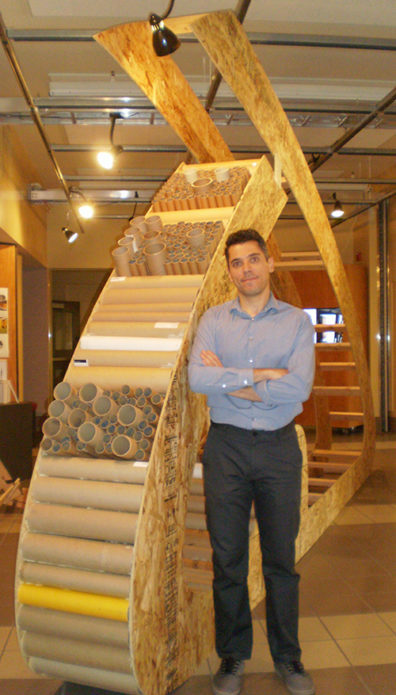 Omar Al-Hassawi, instructor in WSU’s School of Design and Construction, challenged his students to design sturdy, functional, and moveable shelters. The students conducted research on homeless populations in Washington state and learned how communities are approaching the issue. Working in teams, the students brainstormed ideas for designing sturdy, functional, and movable shelters that are also easy to assemble and disassemble , and easy to transport and reassemble. Their focus on low cost and sustainability brought forth designs at a scale similar to those found in tiny home villages and tent cities. Shelters could function as social settings or for having a meal, or to serve as an escape from inclement weather. Although the students focused on homeless populations within the state—especially Seattle and King County—their designs can be adapted to locations worldwide, from refugee camps in the Middle East to the slum villages of India. Several designs progressed to construction. Local businesses donated materials at little to no cost. 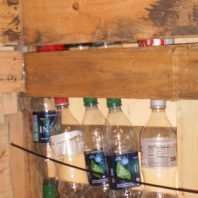 Wood pallets, compressed wood, Styrofoam, plastic sheeting, carpet rolls, mailing tubes, and plastic soft drink and water bottles were used in creative ways. One design imitates the shape of a tent while others conform to their environment, such as a proposed multi-level shelter located under the monorail track in downtown Seattle. A few of the designs feature three walls while others are enclosed structures. Plastic soft drink and water bottles provide privacy, allow daylight, and serve as protection from inclement weather. During the month of September, the built structures and design illustrations were displayed in “Shelter Solutions for the Unsheltered: Responses to the Growing Homelessness Crisis in the U.S. Northwest” at the SDC Gallery in Carpenter Hall. Photos of the projects and additional details about the assignment can be found here.